Altop Offers Smart podium body made with CRCA steel 1.5 mm thick, duly powder coated structure, with security lock, sliding lock cover for touch display max. Size 21.5 diagonal, keyboard, Mouse Drawer, Document camera drawer open on side, Space for keeping extra laptop/Tablet, Point for Gooseneck, USB & LED lamp, space for Touch control screen, Ample space for keeping CPU, UPS, wireless microphone, Amplifier, Speaker and Multimedia Controller. Altop Smart Podium is with 360 degree heavy duty movable castor, Available in different colour choice with. MOQ. Open from front & back for easy Integration. 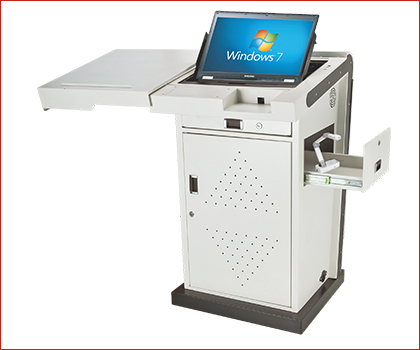 System Integrator Design Podium as per their customers specifications. Ample ventilation & Mini exhaust fan space provided, Main Power Plug socket at bottom with controller space. Multimedia controller & Whiteboard annotation softwares are available with us. Altop also offers Integrated Smart Podium with 21.5 inch Diagonal capacitive / Optical Touch Screen, Gooseneck,LED Lamp, Wireless Microphone, Amplifier, Speaker, CPU as per required Specification, Wireless Keyboard-Mouse, Whiteboard Software & inbuilt Multimedia Controller. All these devices collectively perform to make the presentations impressive altogether. This user-friendly equipment makes the learning entertaining, interactive and thought-provoking.